The words “total loss” probably bring a few situations to mind: convincing your wife it’s logical to spend your entire savings on an around-the-world fishing adventure, or your efforts at becoming a decent golfer. Sometime near the tenth round of golf lessons, you realized that your slice is never going to correct itself and maybe there is a hobby out there much better suited for you, with much less frustration involved. Unfortunately, in the watercraft insurance industry, the conclusion is not always so cut and dry, since many factors can have an effect on the determination whether your boat accident is a total loss or one that is repairable. Simply put, a constructive total loss occurs when the cost of repairs exceeds the insured value of the boat. 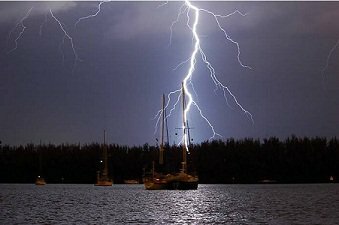 Causes of damage to a boat like fire, water damage from sinking, and even lightning can cause a boat to qualify as a total loss. For instance, we recently saw a claim where lightning punched a hole in the bottom of the boat causing major flooding. It also took out the entire electrical system. Since the insured value of the boat was relatively low, repair costs totaled more than the amount the boat was insured for and resulted in a constructive total loss. Due to its corrosive nature, salt water is extremely destructive to boats. We have seen boats that were partially flooded with saltwater deemed a constructive total loss because the engines were submerged. Saltwater destroys everything, whereas a boat that sinks in freshwater has a chance of being repaired. When a boat burns to the waterline, it is typically deemed a constructive total loss. Unlike automobile insurance, where the amount of money you are paid after your car is totaled is based on the “actual cash value” of the vehicle at the time of loss, quality Boat and Yacht insurance policies are based on “agreed value.” If we agree to insure your boat for $100,000, that’s what you are paid in the event of a total loss with no deduction for depreciation. That’s right, there is no depreciation with an “Agreed Value” policy. Charter Lakes policies are Agreed Value and are underwritten by underwriters that specialize in this type of insurance. Charter Lakes policies also include coverage for personal property including your fishing tackle. If your boat were deemed a total loss, your personal property would be paid in addition to the boat itself. While you may not be the next Jack Nicklaus, at least you might be on the right track to convincing your wife that the boat you just purchased was well worth the investment thanks to your agreed value insurance policy. See, all that charm and flattery for her benefit wasn’t a total loss. At Charter Lakes, we take the worry off your shoulders with insurance policies tailored to meet your specific needs. We sell many kinds of marine policies, all of which are written on an “Agreed Value” basis. They include Yacht Insurance, Boat Insurance, Anglers Choice Insurance, Charter Boat Insurance, Guided Sport Fishing Insurance, Passenger Vessel Insurance, Air Boat Insurance and our Commercial Watercraft Owners Policy.